I was originally going to kick off 2014 with a 200km ride to celebrate not having a cold any longer, but I decided to truncate it to a 150km to better fit around family. The route was pretty much a straight shot from Aldershot to Bristol, exploring a few more of the roads north of the M4. 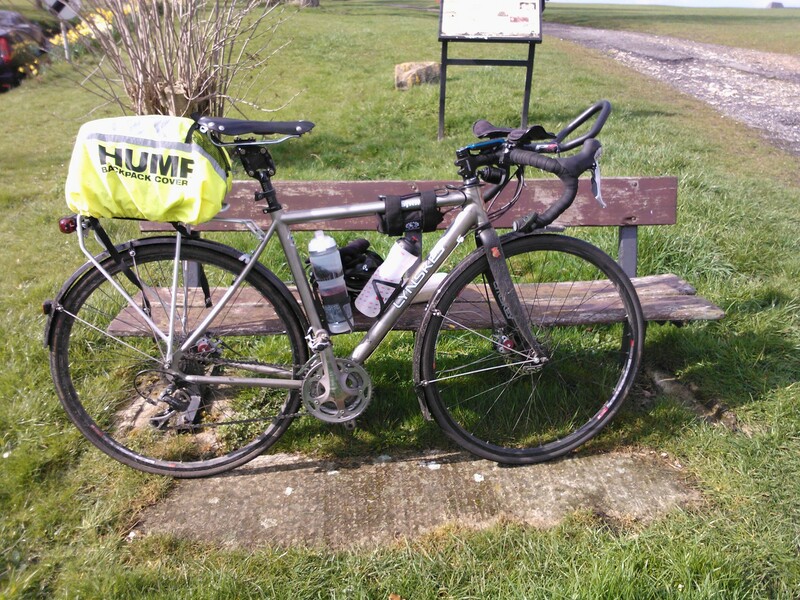 This was the first proper test of the Lynskey Sportive Disc (LSD), here posing while I ate lunch. I still don’t like the height of the rear rack (who needs 6″ clearance from the wheel), but it was the only light one I could find that would also mount a light, which is essential because my rack top bag prevents me from using a seatpost mounted one. I was a little disappointed by the total and moving average (not as good as my 300km last year! ), given I had a mild tailwind all the way. The total average wasn’t helped by getting a puncture at 1/3 distance when I didn’t really gain anything by stopping, then having to stop about 4-5 times to put on and take off my rain jacket. The moving average I don’t think was helped by my foolish use of too many country lanes, many in a terrible condition (which also contributed to the puncture I think). The roads between the M3 and Overton, Whitchurch and the A4 and Broad Hinton to the M4 were particularly lousy. However, the section between Marlborough and Broad Hinton was particularly scenic and a pretty good surface. Also, Chipping Sodbury and Yate provided rather welcome cycle lanes and smooth roads. More A4 next time! By the time I got to Chipping Sodbury, the weather had degenerated to 3 degrees and heavy sleet, a good test of my wet weather set-up. This came through with flying colours: Sealskinz gloves and socks, Specialized rain jacket and Gore “Windstopper Softshell” bib tights. The bike / Rivet Diablo / Thudbuster definitely absorbed the bumps better than the Sirrus, but I still had a little saddle soreness, partly from the non-integral seatpad (old) and perhaps the saddle angle (I had a go on my mum’s bike with no soreness, but getting back on mine the next day was not so pleasant). Still some work to be done. One thing that was a massive improvement with the LSD was the brakes (which was why I got it). I no longer had to fear building up any speed in the wet, because I could be confident I could actually slow the thing down. I also didn’t end up with aching hands at the bottom of every ugly descent. Disc brakes, yes.